BUC Song Project Some people spend their lives chasing money / Walk (Lees) A thoughtful song about how we choose to live. Chorus is "I'm gonna walk humbly with my Lord... with justice and mercy by my side on this road". *SP&P066 Help me do the justice to be done today (Grundy) A simple and hopeful song. Good for kids, and teenagers. Good for everyone else too! Highly recommended. Sound sample (youtube). *AoV2-060 / SFFS 2172 / HPP307 / GtG749 / G(II)518 / GC718 / GC(II)710 / G(3)807 Come live in the light / We Are Called (Haas) Joyful song of mission. I love this, and we've not sung it at BUC for ages! Lyrics, sheet music sample and slowish sound sample here. I would double the speed of this (almost). HPP28 / GtG023 / PH285 / W&R24 / URW083 God You Spin the Whirling Planets (Jane Parker Huber / AUSTRIAN HYMN) Excellent words to a very familiar tune (TiS 772). Really good for the final hymn or response to the sermon. Lyrics. UMH729 / VU682 / LBW161 / WoV762 / ELW627 / GtG373 / PH450 / CP573 / W&R539 / Cha711 / URW140 / 82Hml-597 O day of peace that dimly shines (Daw) A song of hoped-for peace. The tune in Chalice hymnal is really nice (CANDLER) or O WALY WALY which is used in URW. Other sources use JERUSALEM, which is a bit too militaristic for me. Lyrics and JERUSALEM sheet music. New words to old tunes. HiOS031 From this holy time (Barrell) Good words about going and serving "Do justly, love mercy, walk humbly with God". Good for a closing hymn. Straightforward tune. HiOS146 What does our God require (Wallace) Good simple paraphrase, and development, of this passage. Earth-focussed. Sheet music. TiS 618 / AHB 568 / UMH441 / PH405 / CP171 / W&R686 / Cha659 / 82Hml-605 What does the Lord require for praise and offering (Bayly) Some versions quite masculine. More modern hymnals are fine. The tune in TiS is SHARPTHORNE, which is quite good. Older lyrics and a different tune. Reader Susan Bloomfield has also written a new tune, available here. TiS 751 / VU701 / GtG070 / StS054 / SFFS 2174 / Cha661 What does the Lord require of you? (Strathdee) A good and simple round that is a paraphrase of this passage. ATFG589 / NCYC'99 / VU298 When you Walk From here (Good) A simple benediction, commissioning or farewell song. Recorded Music: You have shown us (Martin Smith) An excellent contemporary version of this passage, written by Paul Baloche. Video. Lyrics. Recorded Music: God of Justice (Tim Hughes) Not really a congregational song, and not really my style, but this has some great words for the close of the worship service, in a more contemporary soft-pop-rock hands-in-the-air style. I suggest you stop the recording before it gets to the really tacky 80s synthesizer sounds, unless you really like that, of course. Lyrics and sound sample. Songs for the Micah passage above also fit with this reading. Only those who live right will live with God. 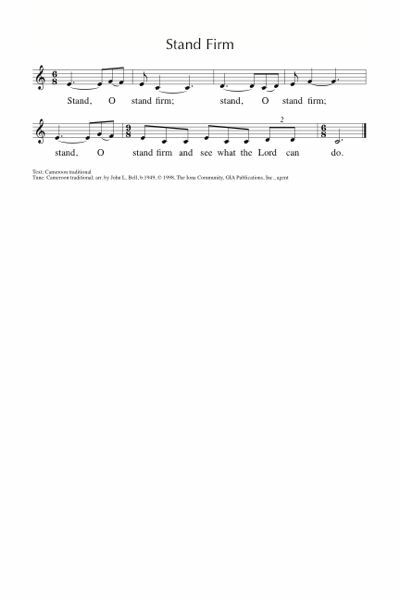 *Online Resource That's how we walk (Bruxvoort-Colligan) This very simple chorus would be great to sing with kids, either during the service or in a Sunday School setting. Good for kids. Sheet music, sound sample and lyrics. *Online Resource We want to be close to your heart (Bruxvoort-Colligan) This is another song that would be simple enough for the congregation to sing the first time they hear it. It's great for kids too. Good for kids. Sheet music, sound sample and lyrics. G(II)21 / GC22 / GC(II)17 / G(3)028 They Who Do Justice (Haas) Simple cantor and response "They who do justice will live in the presence of God". Sound sample. Sheet music and lyrics. *VU575 / SFFS 2153 / GtG700 / PH369 / SP&P139 / W&R574 / Cha614 I'm Gonna Live So God Can Use Me (African American traditional) Good simple tune and meaningful words. Easy to sing and play around with. Good for kids, non-readers and for people for whom English is a second language. Alternatively: PfAS015C I'm Gonna Live So God Can Use Me (African American traditional) A version of the same song, used as a Psalm refrain. Good for kids. Oldy-but-a-goody. 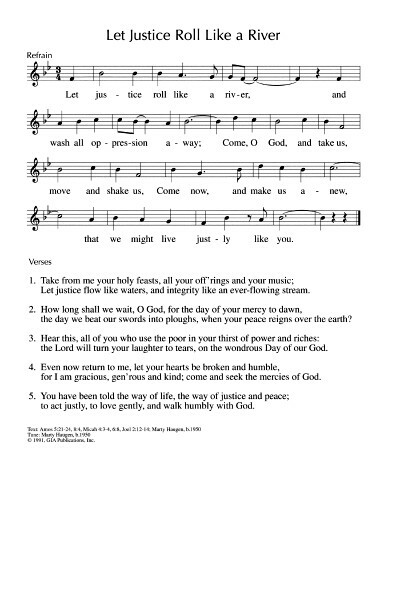 PfAS015A Lord who are they that may dwell (Warner) A nice contemporary sung paraphrase of the Psalm. Easy to sing. PfAS015B Lord who shall be welcome (Seddon) A hymnlike paraphrase of the Psalm. Fairly formal, but inclusive words. *CH008 Lord who may enter your house? (Whoever leads a blameless life) (Bell) A lovely simple psalm response to a chanted or read paraphrase of the Psalm. Emergent Psalter Who may abide on your holy hill? (Everett) Simple response with read Psalm. Sheet music. TiS 5 Justice alone is the way of the Lord (Kimbrough / Young) Good cantor and response. Also in UMH Psalter. 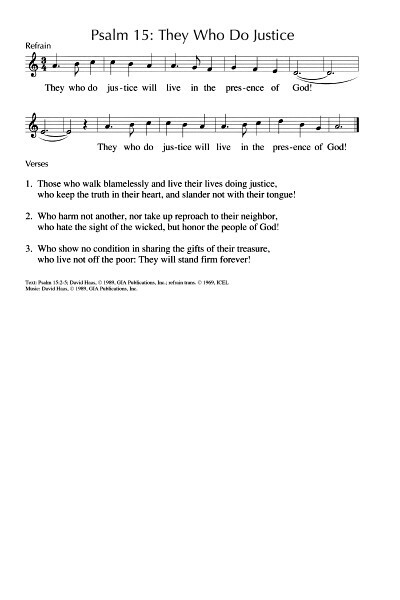 Cha729 Let justice roll down like the water (Oliver) Responsive psalm with sung refrain. ATW 505 Whatever you do (Ylvisaker) Simple and fun. Good for kids. VU284 / GtG230 / G(II)550 / GC760 / Cha333 Joyful Is the Dark (Wren) I really like these words. Hymnals vary widely in the tunes they have set these lyrics to. GtG uses a really difficult key but the tune is nice. VU uses this tune. I'm really not a big fan of either tune, but I think the tune in VU may be simpler. TiS 262 When pain and terror strike by chance (Wren) These excellent words may be particularly helpful if you are in a community where there has been recent loss / disaster. Very familiar Irish folk tune. Recorded Music The cross is foolishness (John Michael Talbot) I don't really know this song, but came across a sample and the lyrics. I think it would be a good one to listen to, or play if someone has the music. Unusual source It really is a worry / Right side up (Downie) A good kid's song about how God's world is not upside down, but right side up. Lyrics (downloads a pdf). We have this in the folders at church. It's also in a book called "Praise God Together" and in "Kidsource 2". Good for kids. Iona (L&A) / ATW 436 / MV112 Amen amen it shall be so! A beautiful chant from John Bell. Works well with a cantor or small choir leading the verses and the congregation joining in on the “Amen, amen it shall be so, amen, it shall be so”. Sound sample (look for the green button). You could do this song instead of reading the passage. I guarantee it will be remembered! StS041 / GC(II)515 / G(3)592 / Lau817 Blessed are they who are poor in spirit / We are the light of the world (Greif) Yep. Okay! Would be best with a cantor, or small choir and the congregation can respond with the chorus. You could even do this instead of the reading. Sheet music and lyrics. Sound sample. *TiS 697 All the sleepy should have a place to sleep (Edwards / PITNEY) Great chorus "Make love happen by God's grace and by God's power. Let God move you on this day and in this hour. New creations will then blossom like a flower for together we can be the hands of God". *Taize How blessed are you who are poor the kingdom of God is yours A lovely simple chant. Sheet music sample. *Iona (I will not sing alone) Blessed are the ones I call the poor / Hey my love (Bell / Maule) A lovely lilting tune (LADY MAISY). This gentle song would be good for a reflection. Sound sample. TiS 288 / Iona Not the powerful not the privileged (Bell) I think it is close enough to Christmas that this song can still be sung in February? HiOS074 If you shut your eyes (Gibson) Powerful words to a lovely tune (SONG OF THE POOR) calling us to wake up and stand with the poor. Carolyn Winfrey Gillette has a good one for the Gospel, "Blessed are the poor in Spirit". And from Jane Parker Huber, on the Beatitudes - "God Teach Us Peacemaking" - No. 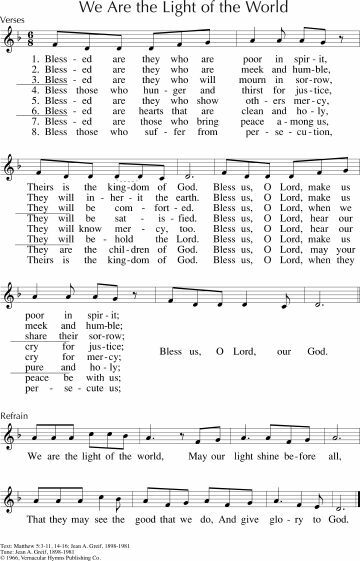 64 in "A Singing Faith"
any chance anyone could post the lyrics for "God Teach us Peacemaking?"